In 1945, the Pentecostal Assemblies of Jesus Christ merged with the Pentecostal Church Incorporated. At that time, Kansas was included in the Oklahoma District, and the District Superintendent was Rev. M. W. Howard. Rev. C. A. Nelson was elected as District Superintendent in 1947. Because of health problems, he resigned in 1955. Rev. M. D. Deal was elected as Superintendent the same year. He served six years, crisscrossing Kansas and Oklahoma to oversee the District. In 1961, Rev. Deal declined to allow his name to be considered and Rev. C. A. Nelson was again elected as Superintendent. By 1966, Kansas had grown to the point where it was able to become a separate district. When in the spring of 1975, Rev. C. A. Nelson retired as District Superintendent, Rev. M. D. Deal was again elected to this office, serving as District Superintendent until his retirement in 1983. Rev. R. D. Whalen was elected as Superintendent of Oklahoma, a position he held until retirement in 2001. Rev. Matthew P. Martin was voted into the office in 2001 and serves as the current District Superintendent of Oklahoma with Rev. Rick A. Hughes voted into office as District Secretary in 2002. The Oklahoma District currently consists of Seven Sections with 108 churches, and 213 licensed ministers. The first Friday of each month is reserved for Sectional Departmental meetings (Fellowship, Home Missions, Youth Rally, Ladies’ Ministries, etc.). 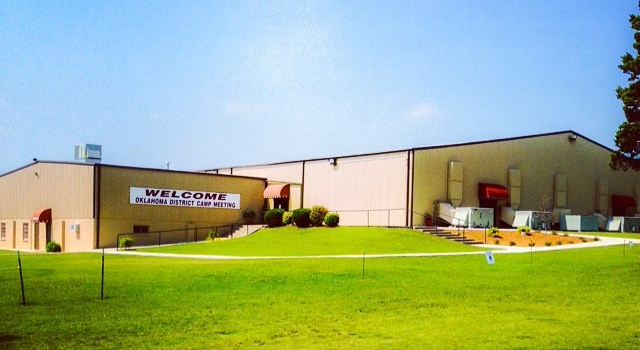 The District operates and maintains a Camp Grounds located on the outskirts of Mustang, Oklahoma to help promote District-wide fellowship. The annual Camp Meeting is held during the last full week in July. Two youth camps (Senior Camp & Junior Camp) are held during the month of June. Other annual events hosted include an Oklahoma Ministers’ & Wives’ Retreat, Apostolic Men’s Conference, Ladies’ Retreat, and Holiday Youth Convention.